Cherry MX switches for all comers! Fresh for PAX East 2014 and April, Corsair is bringing two new versions of its K70 mechanical keyboard to market. While the original (and still available) K70 offers Cherry MX Red switches, the two new offerings boast Cherry MX Blue and Brown switches, respectively. All three switches are mechanical, but they offer different levels of resistance and tactile feedback. Cherry MX Red switches are favorites amongst gamers because they require very little actuation force -- lightning quick. MX Blue and Brown switches take additional force to actuate, and they also offer more feedback. A Cherry MX Blue switch gives your finger a tactile "bump" when pressed, and its accompanied by a hearty click. Brown switches also give you that same bump, but the audible click is less pronounced. In other words: If you want to annoy the crap out of those in your house or office? Get the K70 model with Cherry MX Blue switches. 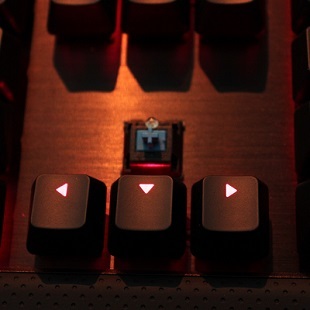 Switches aside, all three K70 models are identical: sleek, minimalist design, per-key backlighting with dimming (only red for color, not full RGB yet), and built-in media controls. All three are now available for $129.99.